It wasn’t just that Durham had “gone rogue” by updating its energy code to 2018 — in the tongue-and-cheek words of another town’s building code official — it actually moved one county north, as far as the building code is concerned. “Put us someplace nice, like Wolfeboro,” joked Audrey Cline, Durham building inspector, explaining the building code change was done so buildings would be built to the even higher energy standards of a zone with a colder climate. New Hampshire’s building codes are out of date, all right — a decade out of date. Buildings in the Granite State are constructed to 2009 standards. A 2012 update has come and gone without New Hampshire adopting it, and now the state is shooting for 2015, just as other states are getting ready to adopt the 2018 update. Indeed, when it comes to commercial codes, New Hampshire is the most out-of-date state in the entire Northeast, according to the Building Codes Assistance Project, and it shares that distinction with Maine when it comes to residential codes, according to the BCAP, and energy codes, according to the U.S. Department of Energy. The New Hampshire Homebuilders Association, whose concerns about some of the provisions in the energy codes contributed to the delay, now says it’s time to move forward, although with a few exceptions. While many communities haven’t gone as far as Durham in making its own changes, some are starting to adopt amendments and updates of their own. How many? Nobody really knows, since there is no central depository of local building codes, though there is legislation to create one. Salem, for instance, has already updated its International Fire Code to 2015 (the state already did that for the Life Safety Code) and might move to update its building code if the state doesn’t get its act together. That’s because fire codes are integrated into the building code, and New Hampshire should be integrated into the rest of the nation, said Jeff Emanuelson, Salem’s assistant fire chief. Belmont has no intention of “going rogue,” in the words of Steven Paquin, the code enforcement officer. But as vice president of the New Hampshire Building Officials Association, he has talked to officials from other towns considering it. Updated codes are not just needed to help structures withstand disasters, such as the recent flooding in the Midwest, they are required under Federal Emergency Management Agency regulations. “We are so far out of date, that [no local contractor] is going to know what to do. They aren’t trained in the new codes,” Paquin said. And then there is the problem with homeowners insurance. The Insurance Services Office takes into account building codes when auditing municipalities, audits that insurance companies use to set rates. “They go by the point system. You get points taken off if you are three versions behind. We are going to take a big hit,” he said. I think it is absolutely shameful that we are 10 years behind. There is no reason for that,” said Paquin. Actually, there is a reason, and it is the energy code. It was an issue in 2016 and 2018, when an attempt to update the codes was shot down on a 188-157 vote in the House, with opponents warning that the updated codes would increase housing costs by 12 percent. The U.S. Department of Energy, however, conducted a state-by-state study and estimated that the updates would only add a few hundred dollars to the cost of a house, pay for itself in three years and save nearly $10,000 over the life of a 30-year mortgage. 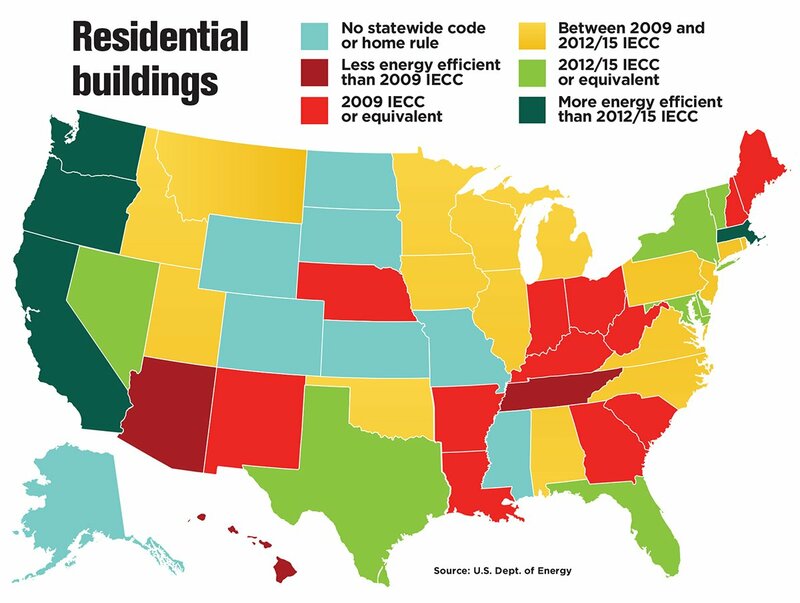 The energy code is an issue this year as well. Originally, House Bill 247, the first bill updating the code, would have left the energy code out altogether. That led Rep. Rebecca McWilliams, D-Concord, an architect, to introduce HB 562, which would have adopted that code too. But the homebuilders and Associated General Contractors also wanted the law to include amendments passed by the Housing Code Review Board. There are 17 of these, including six having to do with energy in residential buildings, that would have prevented certain 2015 energy standards from going into effect. Some of the changes would have been relatively small. The amendments prevent a requirement to do a blower door testing to see how much air can escape. But the amendments also nix the new standard for insulation, increasing it to the equivalent of 5.5 to 7.5 inches, and a standard requiring the “envelope” around a building be enclosed so tightly that you actually need a ventilation system so the air won’t be stagnant and endanger humans. Those amendments were added into McWilliams’ bill, but she insisted that it take effect in 30 months, so that eventually, the full energy code will go into effect more than a dozen years after it was published. “You have to fill every outlet with foam,” said Rep. Mark Proulx, R-Manchester, at an executive session of the Executive Departments and Administration Committee. “We are not on a boat,” shot back Proulx. “Yes, there is an initial cost, but the payback period is short and will last as long as the building exists,” replied Rep. Roderick Pimentel, D-Henniker. “I think when the rubber meets the road, this will add to the cost of a building, and we are in a crisis mode for affordable housing,” said Rep. Steven Beaudoin, R-Rochester. Although Beaudoin introduced the compromise amendment that the committee passed, he ended up voting against the bill. HB 562 was approved by the committee on an 11-8 vote, and the entire House concurred, 193-122. The measure is now on its way to the Senate, which is also working on Senate Bill 49, which would update the rest of the state fire code from 2009 to 2015. Most parties involved in the agreement are optimistic that, this time, the updates will pass. There is chance that the full energy code might be updated even sooner. Other legislation would expire all state Building Code Review Board amendments in two years if not approved by the Legislature (though as Building Code Review Board chairman Shawn G. Bergeron Sr. noted, since these amendments were put into law, that two-year limitation wouldn’t apply to them). But by then, all sides agree, the state is going to be at it again, trying to decide whether to go with the 2018 code. There is even more building code legislation in the works. Two bills, HB 710 and SB 113, would allow the Building Code Review Board to collect local codes and put them in a central repository. 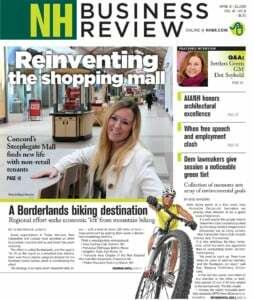 Originally, both bills gave the board the power to overrule local decisions, but that got pushback from the New Hampshire Municipal Association, which reminded lawmakers that the legislative body in towns, which includes town meetings, votes on local code amendments. The House passed an amended HB 710 on a voice vote and the Senate recommended that SB 113 be referred back to committee. That’s a good thing to Cline, Durham’s building inspector, who also said he favors local control. That way, Durham can continue to stay one step ahead of the state when it comes to the energy code, and yes, Durham can pretend it is further north than it really is.